Another major happening this last week in Sacramento was the announcement of progress in bringing bike sharing to Sacramento. Chris Morfas presented to the SACOG Bicycle and Pedestrian Advisory Committee on progress in bike share. Fehr & Peers is writing a business plan for the Sacramento Metropolitan Air Quality Management District. The business plan will include solutions for serving low income people and those without access to credit cards or smartphones (most systems depend on one or both of these to operate). 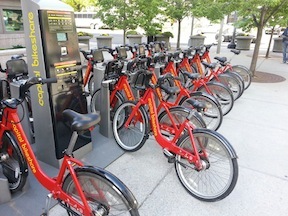 Participants in the annual Cap-to-Cap trip to Washington DC, hosted by Sacramento Metro Chamber, experienced the new and highly successful bike share program there. The bike share business plan should be completed by mid-summer, and the partners will then seek capital funding from SACOG and possibly private investors. The Sacramento system might be integrated with the bay area systems now being designed, with the Amtrak Capitol Corridor being a logical connection between the two. See the Bike Share Bulletin_April_2013.